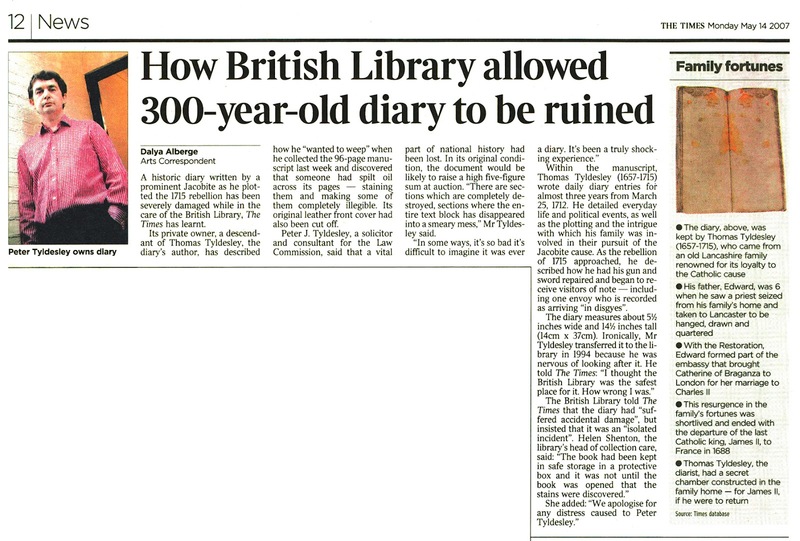 A historic diary written by a prominent Jacobite as he plotted the 1715 rebellion has been severely damaged while in the care of the British Library, The Times has learnt. Its private owner, a descendant of Thomas Tyldesley, the diary's author, has described how he "wanted to weep" when he collected the 96-page manuscript last week and discovered that someone had spilt oil across its pages — staining them and making some of them completely illegible. Its original leather front cover had also been cut off. Peter J. Tyldesley, a solicitor and consultant for the Law Commission, said that a vital part of national history had been lost. In its original condition, the document would be likely to raise a high five-figure sum at auction. "There are sections which are completely destroyed, sections where the entire text block has disappeared into a smeary mess," Mr Tyldesley said. "In some ways, it's so bad it's difficult to imagine it was ever a diary. It's been a truly shocking experience." Within the manuscript, Thomas Tyldesley (1657-1715) wrote daily diary entries for almost three years from March 25, 1712. He detailed everyday life and political events, as well as the plotting and the intrigue with which his family was involved in their pursuit of the Jacobite cause. As the rebellion of 1715 approached, he described how he had his gun and sword repaired and began to receive visitors of note — including one envoy who is recorded as arriving "in disgyes". The diary measures about 5/2 inches wide and 14'A inches tall (14cm x 37cm). Ironically, Mr Tyldesley transferred it to the library in 1994 because he was nervous of looking after it. He told The Times: "I thought the British Library was the safest place for it. How wrong I was." 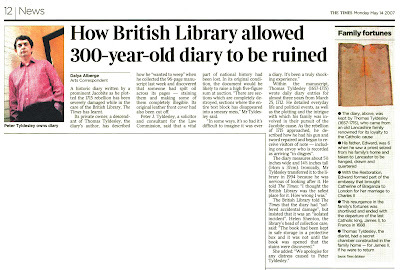 The British Library told The Times that the diary had "suffered accidental damage", but insisted that it was an "isolated incident". Helen Shenton, the library's head of collection care, said: "The book had been kept in safe storage in a protective box and it was not until the book was opened that the stains were discovered." She added: "We apologise for any distress caused to Peter Tyldesley."